Leading Manufacturer of bottle crusher machines, pet bottle scrap machine and bottle grinding machine from Mumbai. Throat Size 12" x 12"
Our company has established a niche in the market for the supply and manufacture of a high quality of products such as the Bottle Crusher Machines which are ideal for pressing the light metals and they offer a high performance to the customers. These products have been made using the best technology available in the market and they are used for crushing the glucose bottles which are used in the hospital so that these bottles cannot be reused. Other details: MODEL: RE 12" Capacity per/hr : 80Kgs/hr. Throat Size: 12" x 12" Length of Blades : 12" Motor HP/KW: 5HP Machine Dimension: L1100 x 950mm Machine Weight: 475Kgs. 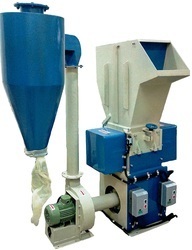 Application Can Shred/Grind: Pet Bottle 500ml to 1 LTR Grinding small articles Bucket, Plastic Containers, PP Caps with 1 HP Cyclone Blower. We are the leading manufacturers and suppliers of Bottle Grinding Machine. Feed opening available : 4"/6"/8"/12"/16"/20"/25"/30"